I Like — What the Fruitcake?! Of course, my favourite shops are the kitchen/dining goodie places. Le Creuset, Villeroy & Boch, Cath Kidston, Home & Cook. But then I'm also big fans of the Pandora, Levi's & Radley stores. And once I've slimmed down some more, I'm pretty sure I'll be frequenting Superdry and the like! Seriously, if you're near enough and haven't been yet, do yourself a favour and get there A.S.A.P! It's only a 30-40min drive from where I am in Dublin which is dead easy, and, would you know it, they actually have dedicated coaches that leave from Dublin city centre! How is that for service? It also means you can enjoy a good bit of vino when you stop to have lunch at L'Officina, because, trust me, you are going to stop and have lunch there. Looks can be deceiving, I have to admit. It's a very large restaurant and very busy which can be off-putting. And often, if you're still a newbie visitor, you'll do what most newbie visitors do and attempt to go for lunch right at lunch time (it's a common mistake to make), and then you end up standing in a queue for a good 15-30 minutes just waiting to be seated. If your growling stomach can't take it any longer and you walk away to get a crepe instead but wonder why everyone else is toughing it out to get their spot? It really is because it's worth it! The wine glasses are large, the view is great, and the food is even better. Traditional Italian married to a bit of Irish. A large Le Creuset bowl of minestrone soup served with fresh Irish soda bread. A flavour packed Italian pork sausage stew with bits of black pudding. A gigantic open faced grilled chicken sandwich on warm ciabatta bread topped with bubbling Irish farmhouse cheese. Honestly, some of the tastiest meals I've ever had since living in Ireland! But, here's an insider's tip. Arrange to arrive at Kildare Village around 12:00-12:30. Go STRAIGHT to L'Officina. Enjoy an early lunch. Then, while you're hitting the shops with a happy and full stomach, everyone else is trying to get a table at L'Officina, which leaves the shops that little bit quieter for care-free browsing! If you're completely unfamiliar with Kildare Village, you might be wondering why you should travel out there when you can just as easily head to town to hit up your favourite stores like Superdry or French Connection. The deal is, it's an outlet mall. And what that means is that everything, and I mean everything, is cheaper than your regular store. Why? Pandora, for example, is at the very least about 30% cheaper than regular retail prices because they stock previous season's goodies. I am so okay with that! Then you have Le Creuset. Of course, they don't have "old" ranges, they're all classics. Yes, new colours come out, possibly a few new dishes etc, but generally, it's not a last season fashion thing. So what's their deal? What I was told on my first visit was that there may be slight, and I mean slight, imperfections. It could be that the paint finish wasn't graduated quite right, or possibly a little speck of something got caught in the varnish and ended up fired there for good. But, it's never a structural flaw, so again I say, you'd be stupid not to! Sometimes, they're simply carrying excess stock or end of range items. And, you always walk away with the same Le Creuset warranty that you would buying your pots from anywhere else. Actually, if you've been admiring my lovely plum coloured cake stand (maybe you haven't... the tart is pretty darn attractive...) I bought that on my last trip. Guess how much I got it for. Is that your final guess? Ok, you can close your mouth now. So there you go. This is why I Like... Kildare Village "Chic" Outlet Shopping. Ok, enough about the shopping, more about the food. Here's the recipe for this amazingly simple NO BAKE Summer Berry Tart. Who wants their oven on in this heat? Ignore the fact that you may have to toast the pistachios, it's a small price to pay. And you can do them on the stove anyway. Actually, I'm not entirely sure if this is a tart, pie, or maybe just a cheesecake... It seems to be a bit of a hybrid of sorts. A rather lovely hybrid! Whatever it is, it has everything. Rich crumbly chocolate, crunchy nutty pistachios. Smooth and just sweet enough creamy filling. Sweet, tart and juicy berries. 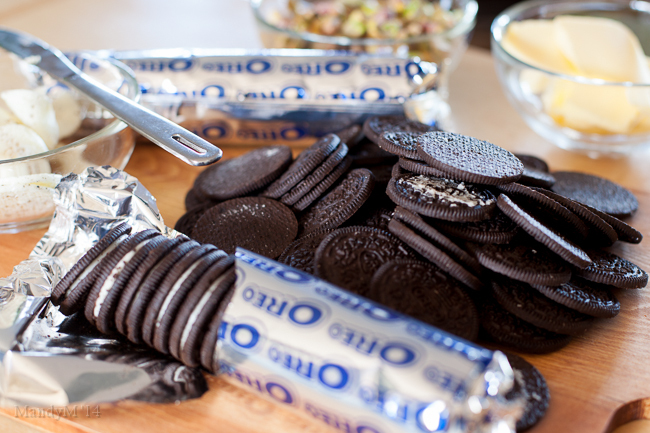 Rich chocolate no bake crust, thanks to Oreos minus the too sweet cream filling (don't hate me!) speckled with bright green toasted pistachios. Because, come on, we deserve a chic tart crust, not just a tart crust. The pistachios add crunch and bursts of nutty flavour. And, I honestly think they make the thick crumbly crust look beautiful and inviting, studding the almost black crust with bright green. The filling? Basically, it's a cheesecake. Tangy and smooth, but, no gelatine or carefully folding in whipped cream. This is still a tart, after all, we want soft and gooey. Now, you can choose to flavour the filling in three ways. 3) If you're a well stocked hipster foodie who hoards interesting inclusions, then you've probably got a bottle of slightly overpriced chocolate extract. Yes, I do too. It's time to crack the seal and use it, after all, that's why we buy the stuff. And finally, to finish off this tart/pie/cheesecake, what could be easier, and prettier, than randomly flinging/dumping/scattering/plopping/strewing beautiful plump, sweet, tart and tangy berries on top. And don't be half assed about it. It's summer and berries are at their peak, so pile them high! They really do look like jewels. If you're wondering why I didn't use strawberries, I wanted to keep my berries whole, and generally, strawberries need to be halved or quartered, and I didn't want strawberry juice getting all over the gorgeous white filling. But, you go right ahead and use them too! Pie/tart/cheesecake, whatever it is, maybe I should rename this tart to Chic Summer Berry Tart, 'cause I think it's very chic! 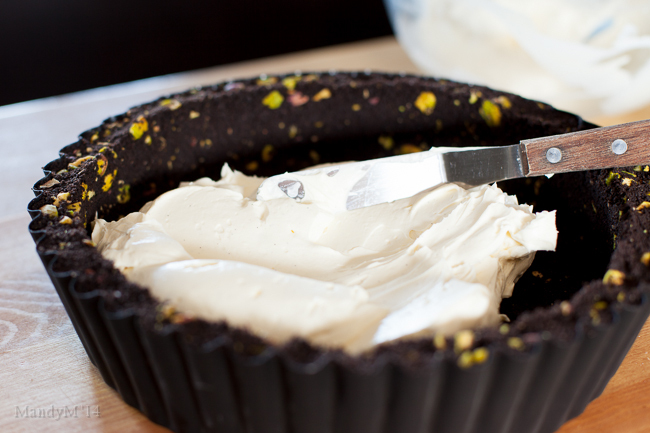 Remove tart shell from the fridge or freezer and pour in the cream cheese mixture. Use a spatula to smooth out the filling. Place tin on an upturned bowl or jar and carefully remove the sides of the tin. *You'll get roughly 120g shelled pistachios from a 250g packet. It's okay if they're salted, in fact, it's quite nice to have them salted. Simply shell the pistachios and try remove as much of the skins as possible, this removed any excess salt. You can buy shelled pistachios, but you will most likely need to roast them. Simple heat your oven to 180°C (160°C Fan Assisted), spread the pistachios out on a baking tray and roast for 6-8mins. You can also roast them over medium heat in a pan on the stove, just make sure to toss the nuts around now and then so that they toast evenly and don't burn. Keep tart refrigerated, and it will keep for about 3 days, although the crust may lose some of its crunch. Posted on August 11, 2014 by Mandy Mortimer and tagged I Like Berries Tart Chocolate No Bake Pistachio Cheesecake Cream Cheese Kildare Village Summer Easy. Now that Summer finally seems to have found us, I've been getting itchy to be out enjoying the sunshine. One of the things I've been looking forward to this Summer is the annual Taste of Dublin sponsored by Electrolux which is held in the beautiful Iveagh Gardens! 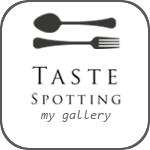 Posted on June 5, 2013 by Mandy Mortimer and filed under Food, I Like..., Review and tagged Food Festival I Like Ireland Taste of Dublin. I'm a big fan of Glenisk dairy, especially their Greek yoghurts. Always thick and creamy, and whether going in to a cake or making a batch of tzatziki, the results are always tasty. So I was really happy when I was sent a few samples of Glenisk's new "Pure Original" yoghurt range! In all honesty, I wouldn't have wanted to try a product I don't already support, so it was a win. I received six 450g tubs of yoghurt. Two were plain, two were mango, and the last two were blueberry. Posted on July 30, 2012 by Mandy Mortimer and filed under I Like..., Review and tagged Glenisk Organic Review Yoghurt. I Like... Mich Turner's "Cake Masterclass"
For those of you who don't know who Mich Turner is, now would be a good time to get aquainted. Why? Because she has a new book out which I'll be giving away to one lucky person! She's also the founder of the Little Venice Cake Company in London, and the cakes made there appear on tables for Madonna, David Beckam, Paul McCartney and even her Majesty the Queen. Posted on April 18, 2011 by Mandy Mortimer and filed under I Like..., Review and tagged Cake Masterclass I Like Mich Turner Review. I have three favourite restaurants that I go to for great pizza, but I think of those three, Oliveto is my favourite for a few reasons. The first reason is the location. It's in Dun Laoghaire right next to the water which makes for a lovely day out. There's a weekend food market open so you really can make a day of it by walking around the market enjoying the sea air and sounds before or after your meal. Posted on January 23, 2011 by Mandy Mortimer and filed under Eating Out, Food, I Like... and tagged Dublin Dun Laoghaire I Like Italian Oliveto Pizza Restaurant Review.